What to do on a guaranteed rainy day? Where to go? You could say I’m a pessimist. If you set low expectations, you’ll never be disappointed, right? 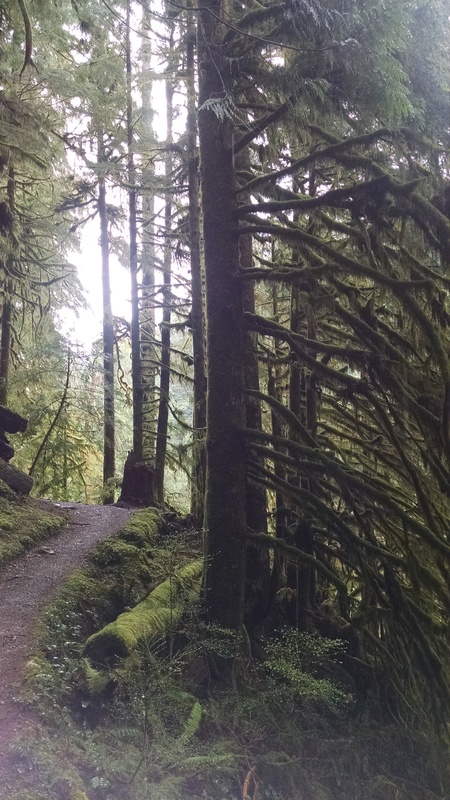 I had no expectations for Boulder River. Boulder River had been on my simple hike list for a few months ever since a buddy recommended it back in December. We had to be back in Seattle by early evening, and it turned out Boulder River was relatively close. And okay, I won’t lie, I might have been sore from Defiance the day before, and the 10 mile runs the two days before that. It was adding up. Zero to sixty, that’s how I do it. So, I present to you, Boulder River. 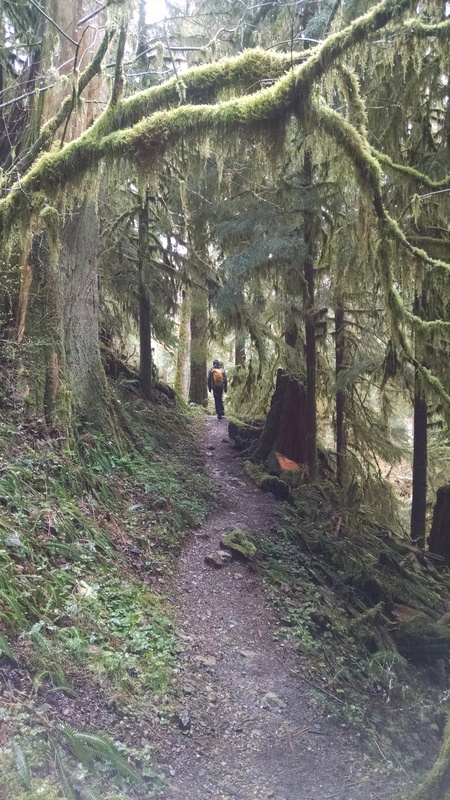 Hiked 3/24/2015, Boulder River is much more than just a stroll along a creek. Did I Trip: I did not. But Jonathan wiped out trying too hard to be cool crossing a log. So the road wasn’t quite as exciting as the road to Mason Lake. At least until the way home, but we’ll discuss that later. Accessible to all vehicles, no big potholes, easy road to follow. 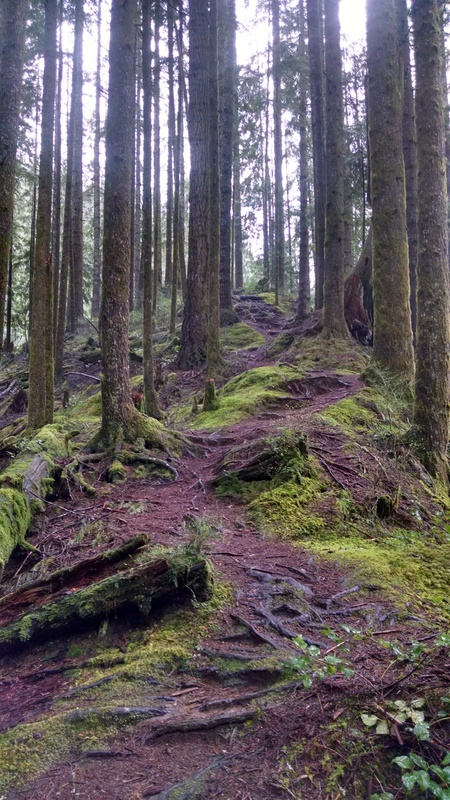 Trail starts out on an old logging road. Very flat and very wide, and I can see why people trail run it. It’d be a great easy run. It was pouring, so we threw on rain pants and our shells and got started. Within a mile I was already impressed. The trail curves to the left, and there’s a steep offshoot to the right that just goes straight up into a green canopy of trees. Of course, we followed. At this point, my camera died, so you’re stuck with phone photos from here on out. I know. Oops. (Side note – gonna plug in my camera for tomorrow’s hike!) Shortly after that offshoot, we found a few campsites near the trail, and just beyond those, a waterfall! 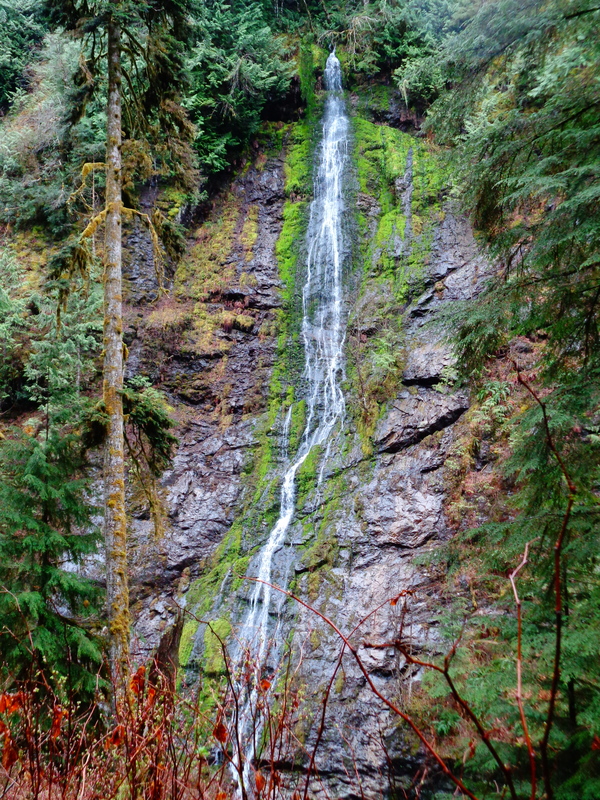 A tall, thin ribbon of water cascading down the opposing cliff, with moss on either side. You hear it before you see it. We ooh-ed and ahh-ed and stared, and finally kept moving. Again, we heard rushing water. Louder than the river. Wait. No way. Glimpses through the trees. Double waterfall. Jonathan for scale. Another waterfall!! A double waterfall! Are you kidding me, I thought we’d just be walking next to a calm flat river, not trekking through rainforest with 80 foot tall waterfalls. Damn, Washington. You never cease to amaze me. We stopped to take a bunch of pictures and just sit in awe. Waterfalls… are totally cool. I haven’t seen one this big since my road trip out here this summer. We finally dragged ourselves away. 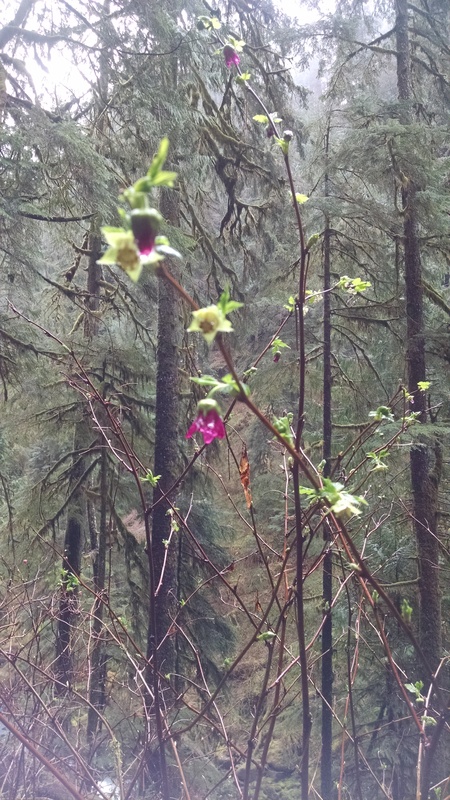 Flowers were starting to bloom along the trail – salmonberry, huckleberry, skunk cabbage. Two of those will be great to eat later this year. The moss was unbelievable, and if it’s this green in March, I have to wonder how it is later in the summer. It’s accessible year-round, though my friend who recommended it said it was actually icy when he was there. Snow and icicles. I can’t imagine. There were a couple blow-downs to get over, and some tree caves to explore. And plenty of small babbling creeks crossing the trail. Wear waterproof boots, folks. Jonathan almost lost one of his mid height boots in a mud puddle, it was that deep. I had no issues in my new La Sportiva Synthesis – shameless plug because they won the Editor’s choice award in Backpacker Magazine, and I was fortunate to receive a pair for testing thanks to Goretex. I don’t have a big sample size, but they’re the most breathable waterproof boots I’ve ever tried. No sweaty feet, and the water that did spill over the edges occasionally actually dried up. Which is insane. Usually I just keep hiking with water in my boots. It’s going to be tough going back to my usual pair, but when it comes to steep, icy, snowy terrain, I stick with my stiffer boots. The Synthesis is very flexible, which is great for lighter hikes (I was carrying around 20 lbs in my pack) but I don’t know if I’d push it on more technical trails. Though I will say (from Defiance a day earlier) the soles grip snow surprisingly well. I was having a much easier time without microspikes than Lee in her Oboz when we were on fresh snow. So we’ll see just how much of a beating these guys can take. Anyway, back to the awesome trail. Flat, well groomed, besides the mud patches that almost stole Jonathan’s boot. We were curious how the trail would end. Would it just peter out? Did it turn into the river and just stop? Or did it keep going? We eventually reached an area with a campsite next to the river (prime time real estate), and the trail ended just beyond it. Just turned into overgrown brush. It used to carry on to Three Fingers long ago. Most of you know I turned into a trail history nerd. I know none of it, but want to learn all of it. I posed my question in my trip report, and got two fantastic responses. The trail was the main trail to the Three Fingers lookout until they put in Forest Road 41 back in the 1960’s. 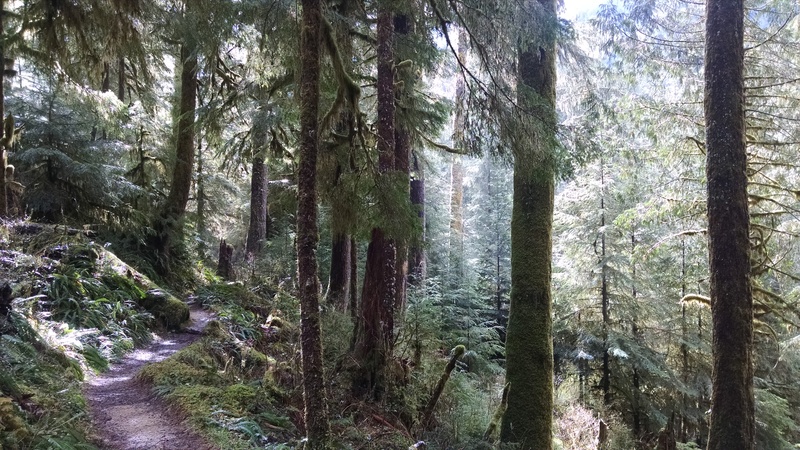 From there on out, the Boulder River trail was unmaintained beyond where you ford the river itself. Obi Tony Kenobi actually tried to bushwack up to the bottom of a waterfall from the Queest-Alb Glacier, and has a pretty cool trip report about the stretch between where the Boulder River Trail ended and where he had to turn around. 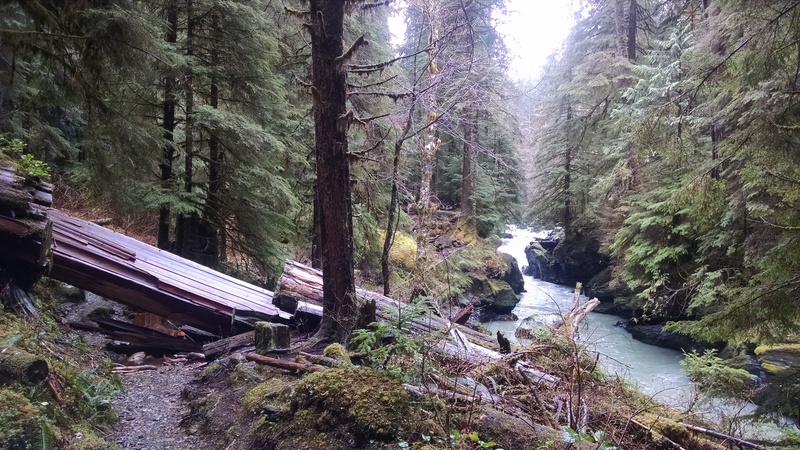 There even used to be a cabin near Gerkman Creek, which joins Boulder River a few miles upstream of the current trail. It’s eerie to think how popular it must have been, while it’s completely abandoned and wild now. So that’s Boulder River for you. 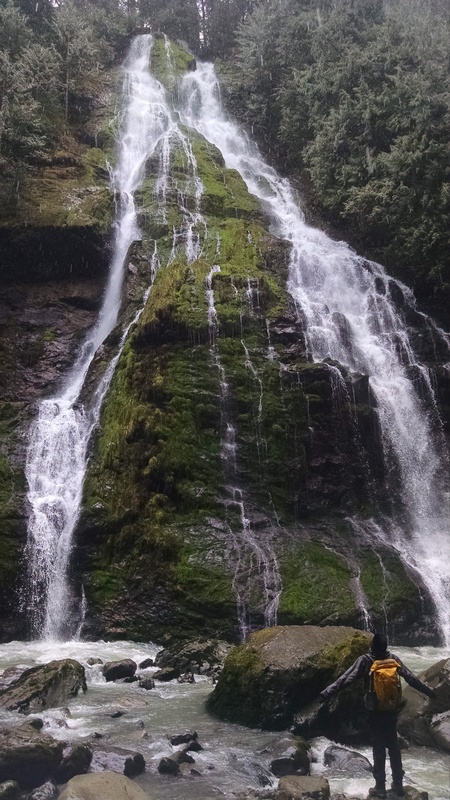 Some neat history, second growth forests, logging roads, abandoned trails, awesome waterfalls, soon-to-be-berries, a flat green hike. Absolutely would repeat. 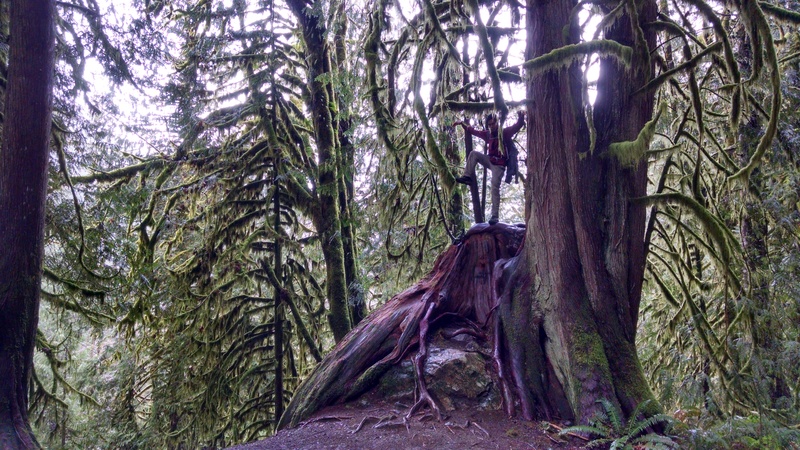 We got a few glimpses of sun, and it turns out it’s a gorgeous hike in any weather. Strava map here, you can see the few offshoots we took that added a bit to the mileage. Oh, and on the way out, we got this great picture of my new car. 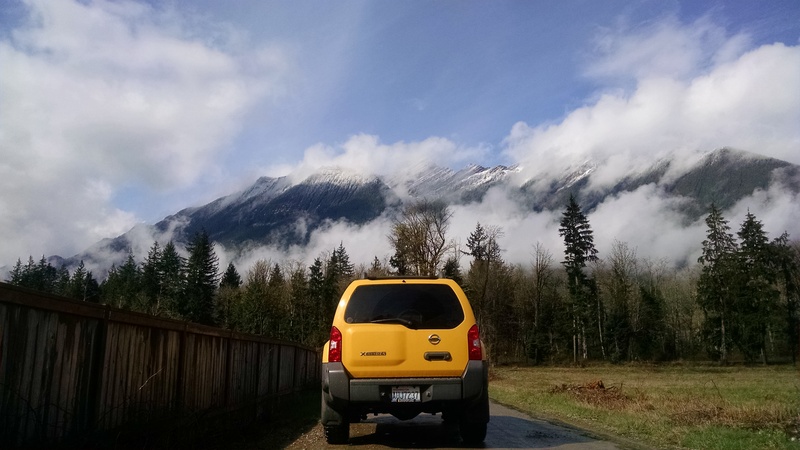 I was taking pictures through the windshield until Jonathan just said “wait, you’ll love this” (I had been snapping pictures of my car at the trailhead) and hopped out to snag this pic. Photo credit to Jonathan Lee, with Subtledream Photography. Awesome waterfalls, awesome car! I like Jonathan’s Subtledream website. Great stuff. Yes! Both waterfalls have short unofficial social trails leading down to the river. They’re steep and on one you have to scramble down some roots and rocks, but you can get down to the rocks along the river. Check it out next time! Especially the double waterfall. It seems even bigger standing next to the river.